the Jumbo LED Lighted Globe. The largest lighted globe we have available is 7 inches in diameter and the lighted globe selection includes both 4 inch and 6 inch round globes. So you can vary the sizes when you hang the ‎decoration(s) from the tree outside.‎ You can also use the product inside, to decorate for a party or other type of celebration. Each globe reflector is designed in a manner where losing reflectors is a thing of the past. The reflector on this selection of lighted globes is brilliantly constructed. The reflectors are high quality and won’t fall off during storms, etc. All of our lighted globes use LED lighting so you can be sure that the color is going to be rich and vibrant. 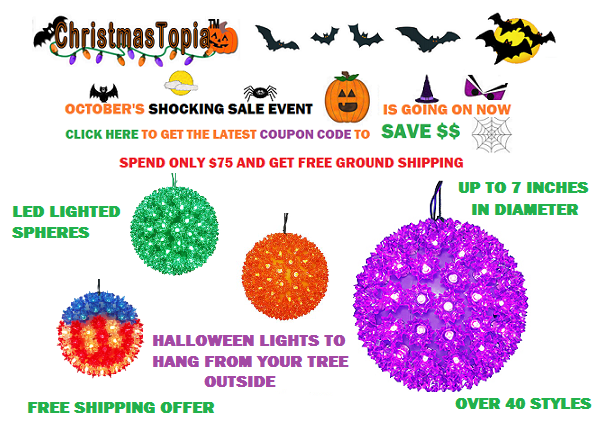 Team Santa Inc. has over 40 styles and sizes of the LED Lighted Globe Halloween Decorations. So there is something for everyone. I must get going, but if you have any questions or comments, etc. please send an email message to support‎@teamsanta.com and a representative will be happy help you.